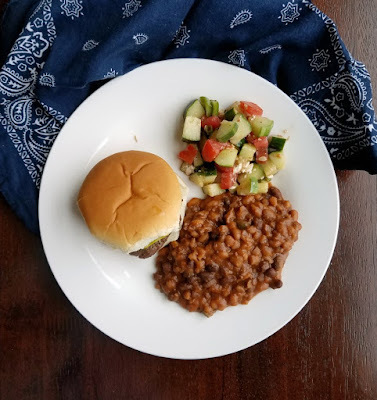 Serve up meaty delicious cowboy beans at your next bbq. They are a hearty and easy to make side dish that is made right in your slow cooker! Nothing says summer bbq like some slow cooked beans. 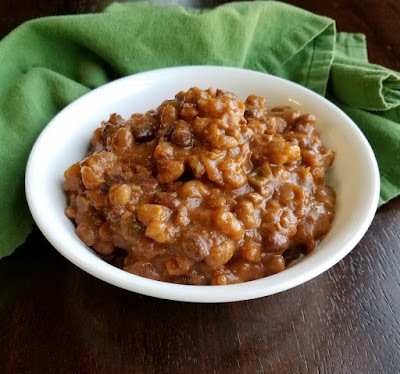 These meaty cowboy beans have a thick sauce that has the perfect balance of sweet and savory. They are a perfect side for potlucks, bbqs and carry ins too! MiMi has been making these beans for years. In fact we have been saying we need to get pictures almost from the beginning of the blog. The problem is she usually makes them when we are preparing for a crowd and it's hard to slow down and take pictures. So when I was thinking of sides to make for our 4th of July get together, these instantly came to mind. They are quick to throw together, they feed an army and the leftovers freeze well so they win on all fronts. 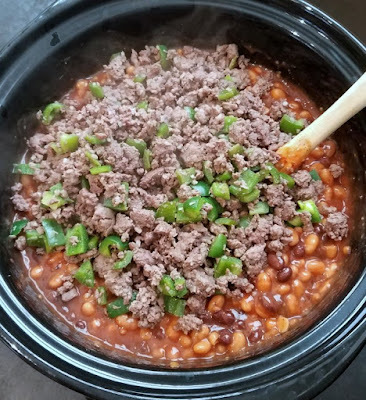 The original recipe was from South Your Mouth, but MiMi has adjusted it over the years to adapt for our large gatherings and we add black beans and green peppers for color and variety. 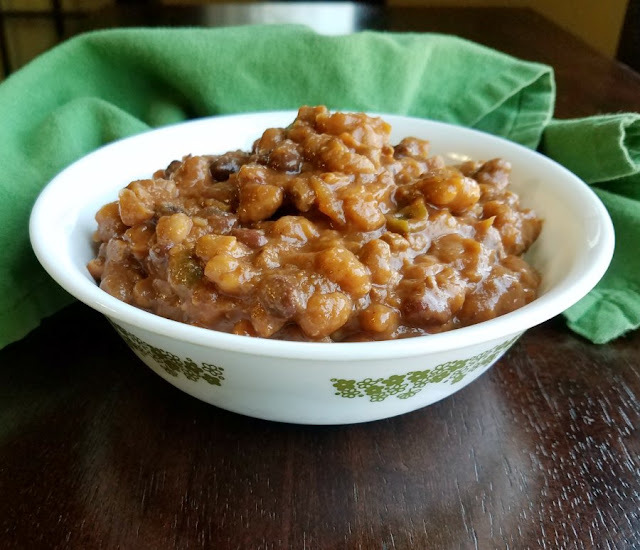 Cowboy beans are almost hearty enough to be a meal on their own, but we normally serve them with pulled pork or hamburgers and hot dogs. 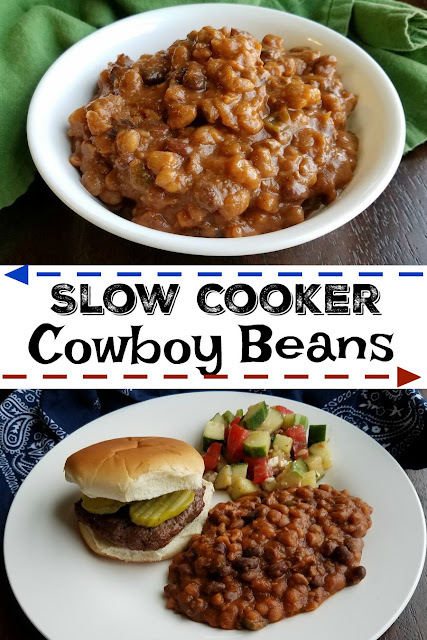 So take it easy on yourself and make some cowboy beans for your next gathering! Dice the onion and pepper. Brown the meat, seasoned with salt and pepper. Add the onion and pepper until softened slightly. Drain any free liquid off the top of the pork and beans and then pour into a 6 quart slow cooker. Drain and rinse the black beans and add to the pot. Stir in the remaining ingredients including the meat and veggies. Cook on low for at least 4 hours, but as long as 8. Cannot wait to cook up a big ole pot of these for my Crew! Happy Friday beautiful friend! They are the perfect side for cookouts! Thanks, Andrea! Oh yum Carlee. I've never had beans with beef like this!! Go Mimi, yet again. Hi Carlee, this sounds good and perfect for a winter warmer after one of our walks. I did dig the slowcooker out to cook some chickpeas for salads, but other than that it's on a summer break. I don't think to use the slow cooker as much during the summer either, but it really is a convenient way to cook without overheating the kitchen! I could definitely make a whole meal just out of these beans!! Yum! Thanks for sharing at Friday Frenzy....PINNED! 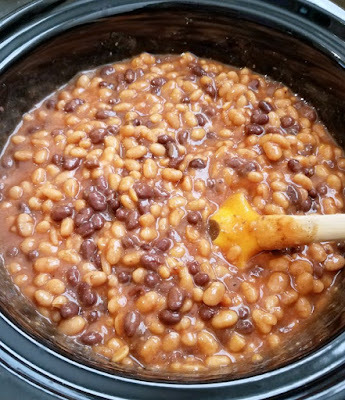 I love slow cooker recipes and I love almost all beans. This recipe sounds perfect. Thank you for sharing. I am sure you will love these then! I love these kind of bean dishes! I've never tried freezing them though, I might make them more often now knowing that it freezes well! You definitely should give that a try! It's a lot to eat at once, but packaging the leftovers in meal sized portions makes it really easy to serve up sides later too! These beans sound so good Carlee. I love recipes for the slow cooker! Thanks so much for sharing with us at the Whimsical Wednesdays Link Party! Me too! Especially for a party, making a side or two ahead in the slow cooker makes it easier to enjoy your guests! I've been loving cowboy beans since the beginning of time! Glad to see a great slow cooker recipe for them. They are so hearty and delicious, aren't they? This is like dinner in a bowl...hand me a spoon! Thanks for joining Crockpot Monday today! I think so too, I could definitely make a meal of them! Thank you!